The LuMini 8x8 Matrix is a great way to add a square of light to just about anything, or even make a screen of a custom shape. The LuMini product line uses the same LED used on our Lumenati boards, the APA102, just in a smaller, 2.0x2.0 mm package. This allows for incredibly tight pixel densities, and thus, a screen with less pixelation. 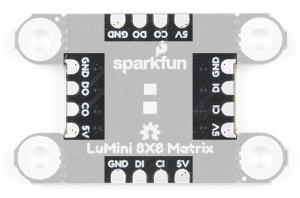 The LuMini Matrix packs 64 LEDs into a measly square inch! 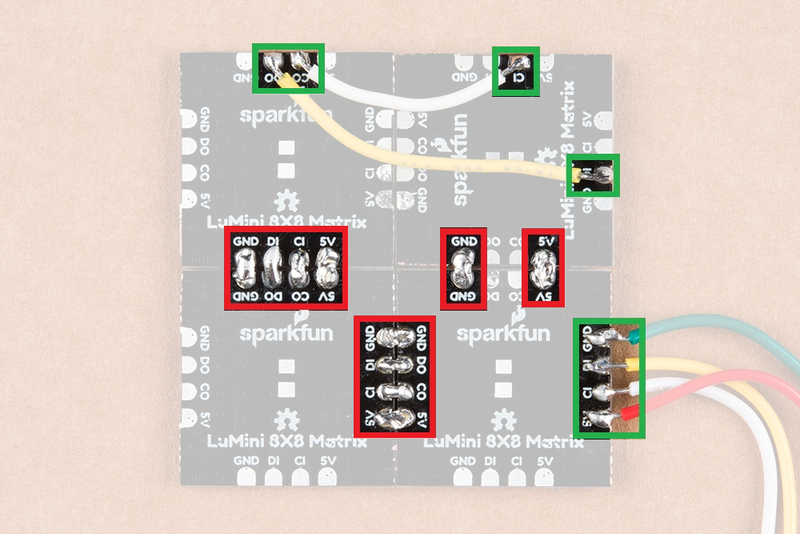 In this tutorial, we'll go over how to connect the LuMini Matrix up to more LuMini Matrices as well as other APA102 based products. We'll check out how to map out a matrix of lights in software so we can get a little more creative with our animations. We'll go over some things to consider as you string more and more lights together, and we'll also go over some neat lighting patterns to get you away from that standard rainbow pattern (Iif you have 16 million colors why would you use 255). You'll need a microcontroller to control everything, however, there are a few things to consider when picking out one to control a whole ton of LEDs. The first thing is that, although they don't have to operate at a specific timing, APA102 LEDs can transmit data really really fast for an LED, 20 MHz fast! So you should use a microcontroller that is fast enough to take advantage of this capability. Another consideration is the amount of RAM taken up by the LED frame; especially, when you start getting into higher LED counts. Each LED takes up 3 bytes of space in RAM. This doesn't sound like a lot, but if you're controlling 5000 LEDs, you might need something with a bit more RAM than your traditional RedBoard. The below chart outlines the amount of LED's where you may start running into memory issues. Keep in mind that these are very generous estimates and will decrease depending on what other global variables are declared. It's pretty easy to choose either the ESP32 or Teensy 3.6 when it comes to stuff like this, as they've got a ton of overhead in clock cycles to run wacky calculations for animations. However, if your project isn't all about lights, and you're just tossing a LuMini Ring on a project as an indicator, less powerful microcontrollers will suffice. You can either estimate the necessary size of your power supply by taking the amount of LED's and multiplying by 60 mA (0.06 A) which is the amount of current it takes to run an LED at full white. This calculation will give you the maximum amount of power your LED's could draw. However, most of the time, this is a gross overestimate of the amount of power you'll actually end up consuming. Instead of calculating the maximum current draw, I usually like to test my completed installation on a benchtop power supply using the brightest animation it'll be running, and then add 20 or 30 percent to give myself a little wiggle room if I want to turn the brightness up in the future. You will also probably need some soldering equipment and a 4.7 µF SMD capacitor (in a 603 package). The capacitor will be used to decouple the power supply. This will reduce high frequency noise in the power line and compensate for voltage drops due to the change in current demand from devices turning on and off. The 603 package might be a little tricky to solder, a good set of tweezers will help. 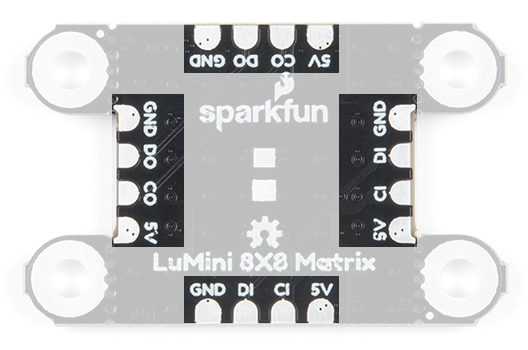 The LuMini Matrix is powered and controlled using a few pads on the back of each board. Each board has a set of pads for 5V and GND (ground), a set of pads for DI (data in) and CI (clock input), and a set of pads for DO (data out) and CO (clock output). These pads are outlined in the below image. LuMini Matrix 8x8 I/O pads. The APA102 is an addressable RGB LED with 8-bit color (256 colors) and 256 levels of gray scale. This essentially means that you can tell each individual LED what color you want it to show and how bright it should be. APA102 LED under a microscope. Click to enlarge image. The LEDs employ a 2-wire communication protocol consisting of a clock line and a data line. 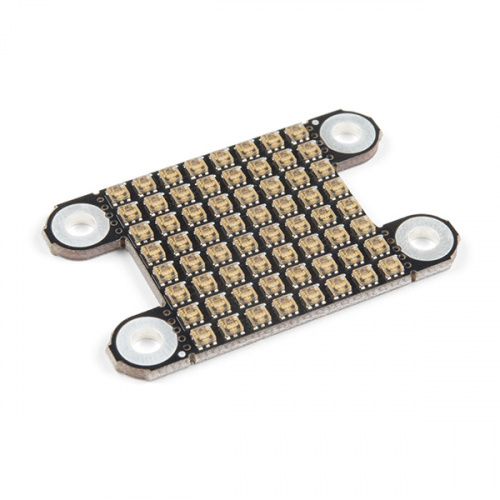 While this requires one more wire than standard WS2812B addressable LEDs, the advantage is that the communication with the LEDs becomes somewhat timing independent, allowing you to run these off boards without long, precisely-timed data streams. Note: We've found that setting the global brightness using the FastLED Library to 32 is good for testing, as it's easier on the eyes. You can also tape a small piece of paper to the front to get better diffusion of each LED. Each matix acts like a string of LEDs. The indexing (or numbering) of the LEDs moves from left to right, bottom to top of the board, on the LED facing side, as shown in the diagram below. LED indexing for LuMini Matrix 8x8 (Left: Front or LED facing side, Right: Back). Click to enlarge image. In larger installations you may need to add a decoupling capacitor between power and ground to prevent voltage dips when turning on a whole bunch of LEDs simultaneously. The spot to add this optional capacitor is outlined below. LuMini Matrix 8x8 pads for capacitor. We'd recommend the below 4.7 µF capacitor. 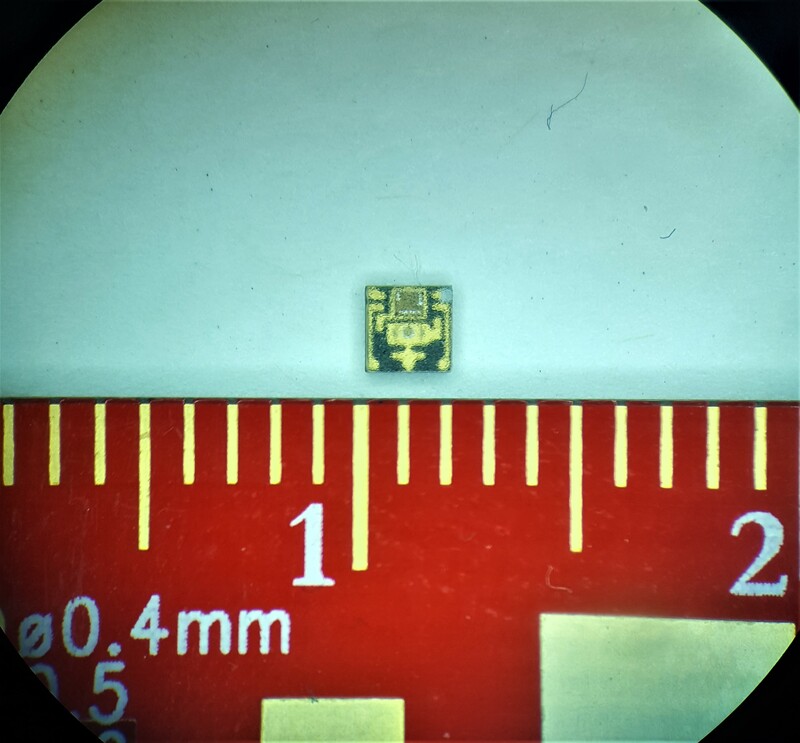 If you've never done surface mount soldering before, this part might be a little tricky, but check out our SMD tips and tricks on doing just that. 4.7 µF capacitor on a quarter for size comparison. Note: You only need capacitor one per setup and not one for every board in your installation. As with most high power LEDs, the APA102 LEDs used on the LuMini Matrix 8x8 generate a lot of heat. To keep the LEDs from damaging themselves and the board, the ground plane (back/bottom layer of the board) is used for heat dissipation. The stand off pads are also tied to the ground plane and can be used for greater thermal dissipation. Note: Be careful to make sure your animations don't run too hot, and if they do, you can always lower the brightness (see Warning below). We've found that setting the global brightness using the FastLED Library to 32 is good for testing, as it's easier on the eyes. Even if all the LEDs are set to white, the temperature of the board will idle around (90-95°F... depending on your ambient room temperature). Setting all the LEDs on white and turning the brightness up all the way up will result in damage to your board and may result in injury and/or fire ! We only ran our display for about 20-30 seconds before we decided to turn it off, in that time it climbed to over 300°F and was still rising! Soldering wires to the pads on the LuMini Matirx is pretty simple. The trick is simply to pre-solder both the pad and wire before attempting to solder the two together. Then, press the wire onto the pad and solder away! Check out the below GIF if you're a little confused. The APA102 LED is controlled on an SPI-like protocol, so it's generally good practice to connect CI on the LuMini Matrix to SCLK on your microcontroller, and connect DI to MOSI. 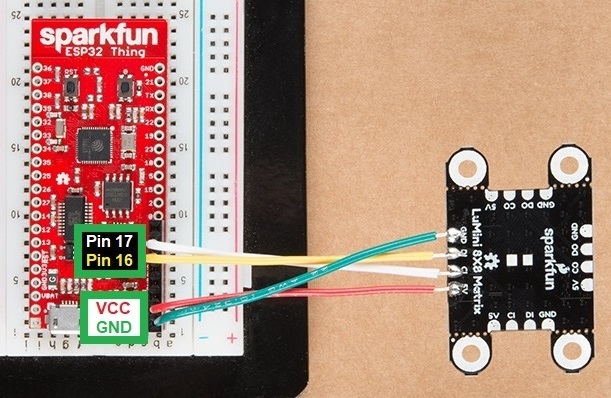 However, This setup isn't required, and you can connect data and clock up to most pins on your microcontroller. 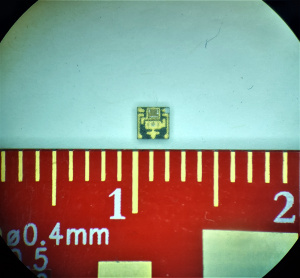 Go ahead and determine which pins you will use, and solder your Data and Clock lines into your microcontroller. In the examples below, we will be using a SparkFun ESP32 Thing. For the hardware connections, the 5V line is connected to the VUSB pin, GND is connected to the GND pin, DI is connected to pin 16, and CI is connected to pin 17. Pin connections to SparkFun ESP32 Thing for examples below. Click image for wiring on the matrix panel. Now that we know how to solder to these pads, we can start making a grid of LuMini Matrices, or even tie them to other APA102 based products. To do this, all we'll need to do is solder CO and DO of one matrix panel to the CI and DI of the next matrix panel. Below, is an image multiple matrices soldered together to make a larger display. Castellated soldering for I/O pads. 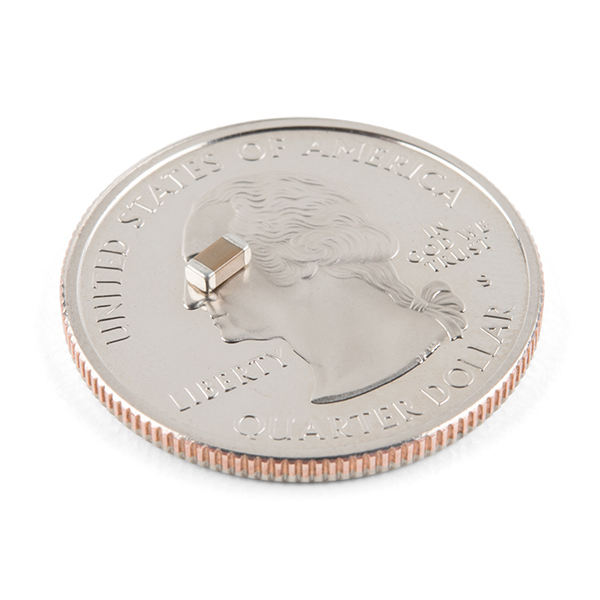 Troubleshooting Tip: The standoffs mounting points can be clipped with a pair of dikes (diagonal wire cutters). You may need sand or file the edges square, since the diagonal cutters will leave a rough edge. 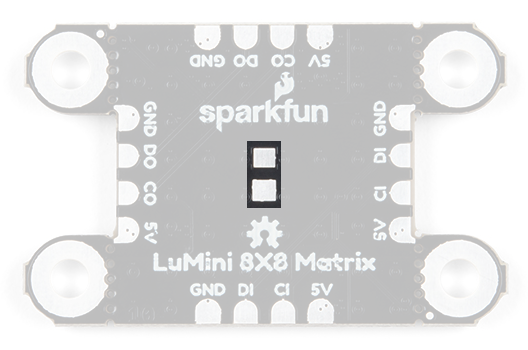 We'll be leveraging the ever popular FastLED library to control our LuMini Matrix. So go ahead and start by downloading the library by clicking the button below or searching for FastLED in the Arduino Library manager. SparkFun has also written some example code specific to the rings to get you started. These example sketches can be found in the LuMini 8x8 GitHub Repo under Firmware. To download, click on the button below. Note: Be careful to make sure your animations don't run too hot, and if they do, you can always lower the brightness LEDS.setBrightness(##); (see Warning below). Setting all the LEDs on white and turning the brightness up all the way up will result in damage to your board and may result in injury and/or fire ! Glen Larson invented the Larson Scanner as an LED effect for the TV series Knight Rider. In this example, we'll begin to reproduce it that effect and add in some color for flavor. This sketch is a great way to test all of the LEDs. First, we begin by creating an object for matrix CRGB matrix[NUM_LEDS]. We then, initialize the matrix using the LEDS.addLeds function below. Notice the BGR in this statement, this is the color order, sometimes, the manufacturer will change the order in which the received data is put into the PWM registers, so you'll have to change your color order to match. The particular chipset we're using is BGR, but this could change in the future. In this sketch, the global brightness is set to 32 LEDS.setBrightness(32);. Although, the full range of this setting is 0 to 255, we've found that 32 is good for testing, as it's easier on the eyes. Even if all the LEDs are set to white, the temperature of the board will idle around (90-95°F... depending on your ambient room temperature). Our animation is then contained in the fadeAll() function, which loops through every LED and fades it to a percentage of it's previous brightness. Our loop() then set's an LED to a hue, we increment the hue, then show our LEDs. After this we use the fadeAll() function to fade our LED's down so they don't all end up being on. matrix[i] = CHSV(hue++, 150, 255); //display the current hue, then increment it. Your code should look like the below gif if you've hooked everything up right. If thing's aren't quite what you'd expect, double check your wiring. You should see this on the LuMini matrix if you have done everything correctly. As a challenge, see if you can create an actual Larson scanner. It should only take a few modifications to the example code. In this second example, we'll use the serial terminal to control the color displayed by the matrix. We initialize everything in the same way. We then listen for data on the serial port, parsing integers that are sent from the Serial Monitor from the Arduino IDE and putting them in the corresponding color (red, green or blue). The code to accomplish this is shown below. Go ahead and upload this code, then open your Serial Monitor to a baud rate of 115200. It should be displaying the current color value (R:0, G:0, B:0), if not. Serial monitor entries (for animation below r255 -> r100g50b200 -> r255g255b255). You may get some weird responses using low values for RGB; around 50 or less. The letters for the color entry are not case sensitive. You can also send multiple entries. Try sending r100b50 g200 or r0, b200,g150 in the serial monitor. will set your entire panel color to white. The LuMini Matrices can be easily daisy chained to create a screen of a custom size. When dealing with any screen or LED matrix, you'll want to be able to call some sort of function XY(x, y) to return an LED number at any given coordinate. In order to do this, we'll need to outline the path in which we've daisy chained our matrices as well as the orientation of each matrix. First let's look at the path that our matrices take. Completed assembly for 2x2 matrices with matrix map marked. The orientation of third panel should be rotated 90° clockwise (from the front of the panels). Click image to see the soldering connections on the back of the assembly. I've soldered together 4 LuMini matrices in the below picture. Each number represents which number the matrix is in the chain. I like to start at the bottom left, but you can lay out your matrix however you want. We'll then have to edit our matrixMap[moduleHeight][moduleWidth] object to tell our code where each matrix is. Notice how the numbers in the table identically map to the numbers on the matrices in the above picture. We'll then need to adjust the orientation of each matrix in code so that any physically rotated matrix gets it's pixels rotated in code as well. The easiest way to check the orientation is to first change the values of the int orientation[moduleHeight * moduleWidth] to 0, which is the default orientation when a LuMini matrix is facing straight up and down. Go ahead and upload your code. The last matrix should have a line going from top to bottom instead of left to right. If your entire module was properly oriented, you would see a line of color swiping from left to right. If any of your matrices have a line swiping in a different direction, take note of the direction the line is swiping on the problem module. Use the below table to match the direction you're seeing to the necessary orientation in the int orientation[moduleHeight * moduleWidth] object. Since the last matrix has a line swiping from top to bottom due to its orientation, I'll change the orientation of the last matrix like so. You should see this on the 2x2 matrices if you have done everything correctly. In this final example, we'll leverage FastLED's palette object (CRGBPalette16) to create and visualize a color palette on our matrix. We have much the same initialization as our previous examples, only this time we also initialize a CRGBPalette16 object which will be full of colors along with a TBlendType which will tell us whether or not to blend the colors together or not. This can be either LINEARBLEND or NOBLEND. To populate this gradient, we use examples 2 and 3 to find the colors we want to put into our gradient. The gradient included is a bunch of colors created in HSV space, but you can easily change to RGB space if you prefer. You can also use any of the preset palettes by uncommenting the line that sets it equal to currentPalette. We then use the ColorFromPalette function to put the colors from our gradient onto our LED matrix. Play around with the colors in your palette until you're satisfied. 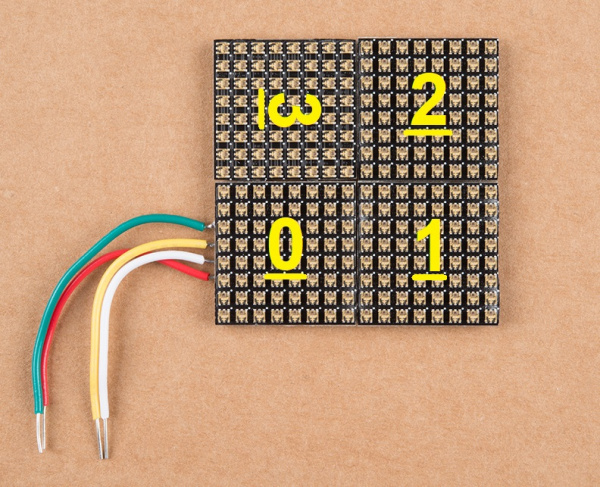 If all is hooked up correctly your LED matrix should look something like the below gif. 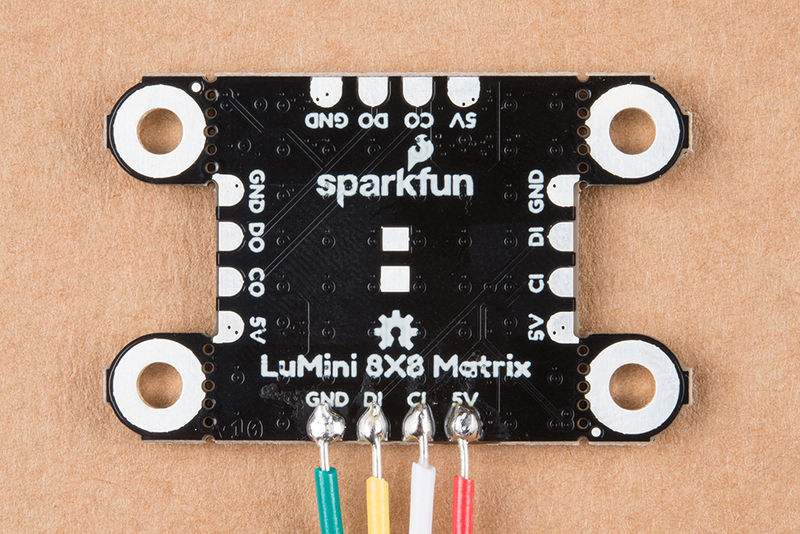 Now that you’ve successfully got your LuMini Ring up and running, it’s time to incorporate it into your own project! For more information about the LuMini Matrix, check out the links below.